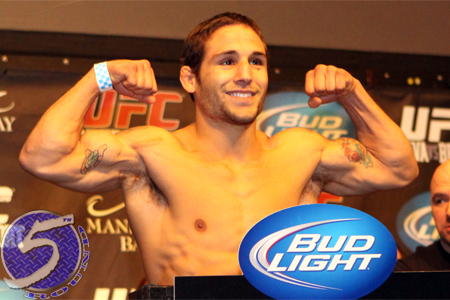 As the old adage goes, “Nothing good ever happens after midnight.” According to the HanfordSentinal, local authorities are looking for UFC featherweight Chad Mendes (Pictured) for his alleged involvement in a 40-man bar brawl. Mendes reportedly sucker punched a patron in the face and bolted out the back door at 1:18AM on Saturday morning. “Money” appeared to be intoxicated and began cursing at deputies when they attempted to break up the initial fight between two other partygoers. The melee then grew to about 40 people and leaked out into the street. That’s when officers recognized Mendes. When authorities asked Mendes to leave, he opted to go back inside the Lacey Inn Bar and clock a man in the mug who “never even saw him coming,” said assistant Sheriff Dave Putnam. Deputies proceeded to chase Mendes along the railroad tracks behind the bar, but soon lost him in south Hanford. The area native has not been seen since. According to Putnam, Mendes’ victim managed to leave the altercation with just a contusion. However, given Mendes’ status as a professional fighter, the 27-year-old could be in some hot water. “If we don’t speak with him by Monday, then we’ll request that the District Attorney’s Office file charges against him,” Putnam said. “Then we can pick him up on an arrest warrant. Mendes was most recently seen posting a TKO victory over Cody McKenzie at UFC 148. He owns an impressive 12-1 MMA record.